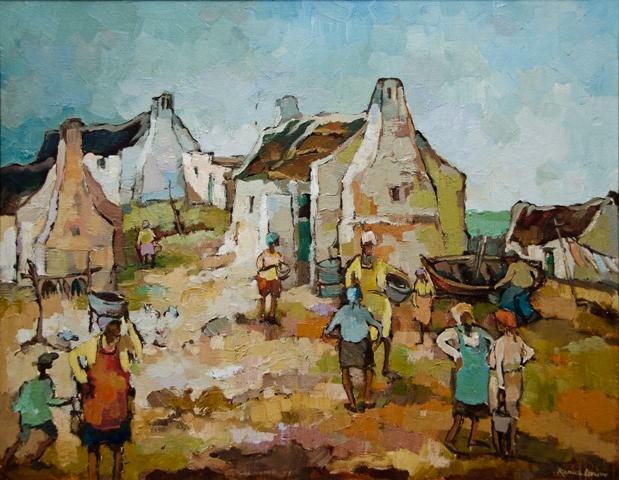 Self-taught artist Kobus Louw, was born in Cape Town in 1933. Kobus Louw has been an art lover from a very young age, especially of the visual arts. Even though Kobus has developed his own distinctive style, he still enjoys influences of artists like Pierneef and Gregoire Boonzaaier. His oil paintings are representatives of his beloved Cape and include scenes from this area like coastal villages, cottages, fisherman and many more. His use of colour does remind one of artists like Gregoire Boonzaier and Dawid Botha, but with a certain vibrancy that is unequalled. He adds a bright sweep of colour in his landscapes that makes you appreciate his spontaneity. Kobus doesn’t neglect his negative spaces and makes his art work in such a way that it captures the viewer’s attention and keeps it. During his 38 years of working for a financial company, Kobus used every available moment, during week-ends as well as during holidays to paint. It was during this time that he participated in solo- as well as group exhibitions in Stellenbosch, Paarl, Somerset-West and Cape Town. His first exhibition was in the Art Room, Edrich, in Stellenbosch. Since his retirement in 1992, Kobus can now focus on his true calling and love, his painting.